How are scholars across the country creating humanities-centered solutions for our communities’ most pressing challenges? The National Humanities Alliance (NHA) is working to answer this question through Humanities for All, a new website connecting researchers, students, and community members with a database of over 1,400 public humanities projects across all fifty states, Washington, D.C., and Puerto Rico. Over fifteen UMBC projects are included in the site, half of them from UMBC’s Baltimore Traces initiative. Jessica Berman (l) and Denise Meringolo (r) in the UMBC Dresher Center. Photo by Marlayna Demond ’11 for UMBC. Daniel Fisher, project director at the NHA, notes that the goal was not to define “publicly-engaged humanities,” but to provide an active resource. “First, we want to encourage humanities faculty members and students to engage with the public in their research, teaching, and programming. 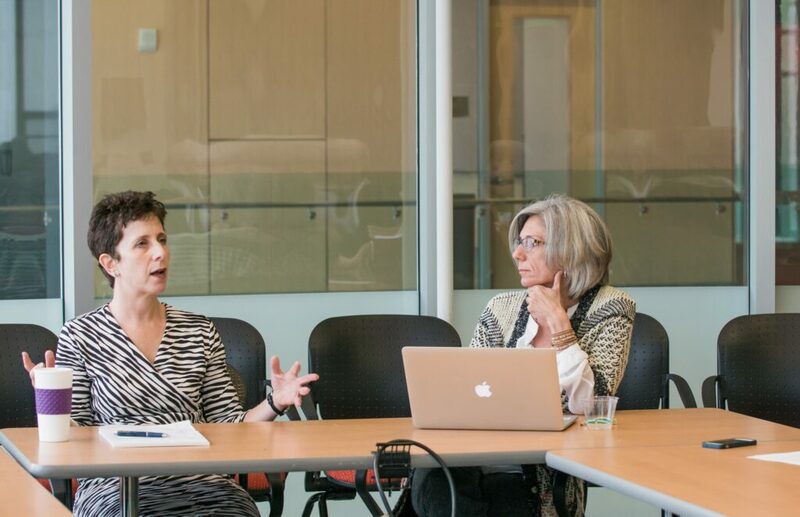 Second, we want to help humanities advocates tell a broader story about the value of the humanities in higher education and in communities across the U.S.,” shares Fisher. Bill Shewbridge, professor of practice in media and communication studies, has multiple collaborative projects represented under the broader Baltimore Traces initiative. He appreciates being included in Humanities for All, with its potential to connect his work to new audiences. 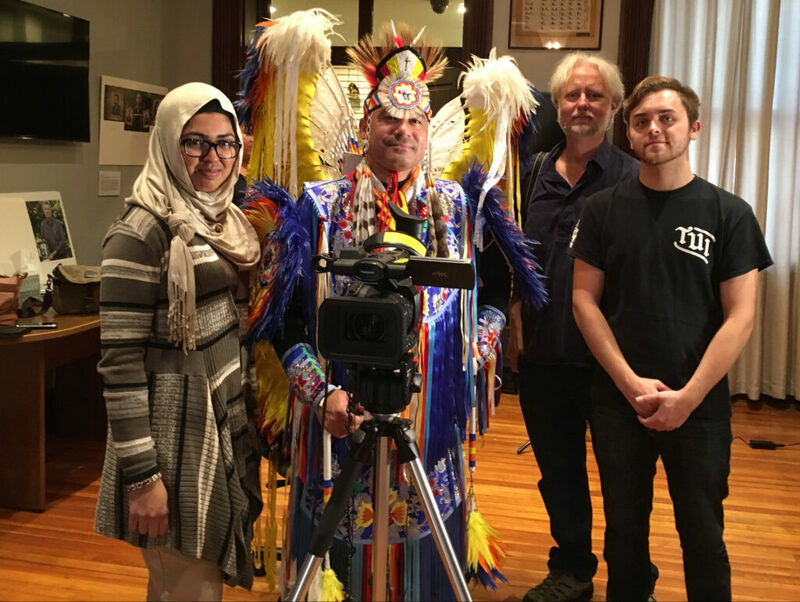 L-R: Najla Nadeem ’19, media and communications; E. Keith Colton, administrative director of the Maryland Commission on Indian Affairs; Bill Shewbridge; and Tyler Roseberry ’19, media and communications. Several projects by Nicole King, associate professor and chair of American studies, are featured on the NHA site, particularly under the Baltimore Traces feature. King’s work is representative of the variety of multimedia projects included in the database, incorporating not just written materials but also apps, podcasts, websites, and photography, to effectively facilitate and enhance conversations about identity, history, self-expression, culture, political agency, and power. 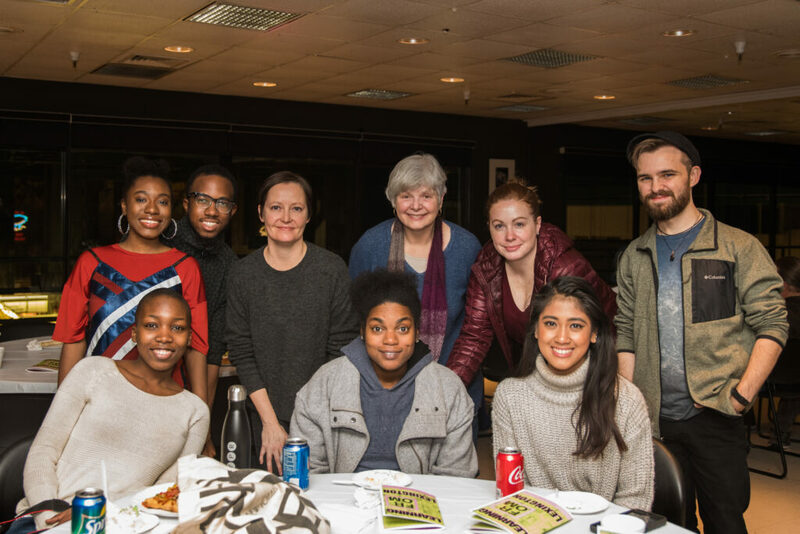 King’s 2017 Learning from Lexington students hosted their Zine Launch + Open Mic at Lexington Market. Image by Kimberly Zerfas. Shewbridge and King’s work includes collaborations with several essential partners, including Kate Drabinski, senior lecturer in gender and women’s studies; Dustin Roddy ’14, manager of New Media Studio; Steve Bradley, associate professor of visual arts; Michelle Stefano, Library of Congress folklife specialist; Stefanie Mavronis ’12, political science and media and communication studies; and Marc Steiner, radio host. The Humanities for All database also includes “Revolution of the Eye: Modern Art and the Birth of American Television” and “For All the World to See: Visual Culture and the Struggle for Civil Rights,” led by Maurice Berger, research professor of visual arts. Additionally, it features Preserve the Baltimore Uprising, led by Denise Meringolo, associate professor of history, and Joe Tropea ‘06, history, M.A. ‘08, historical studies, and the Breaking Ground civic engagement movement initiated by David Hoffman and collaborators. Banner image: Discover Baltimore group tour of historic Lexington Market, UMBC summer session 2017, by Marylana Demond ’11 for UMBC.